Long ago, Google provided Google BlogSearch, as one a way of surfing the blogosphere. One of the challenges of using BlogSearch was that we were never sure what we were surfing. Some people wanted to see only "blogspot.com" published Blogger blogs - and other people wanted to see all Blogger blogs, including those not published to "blogspot.com". Some ingenious blog owners published "Blogger blogs" of doubtful integrity, simply using the URL of "blogspot.com" - and people accepted such blogs as righteous, simply because Blog Search would list them in a search page. Advanced Blog Search is no more. 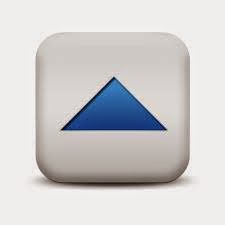 Blogger blogs can only be identified, with reliability, using "blogspot.com". 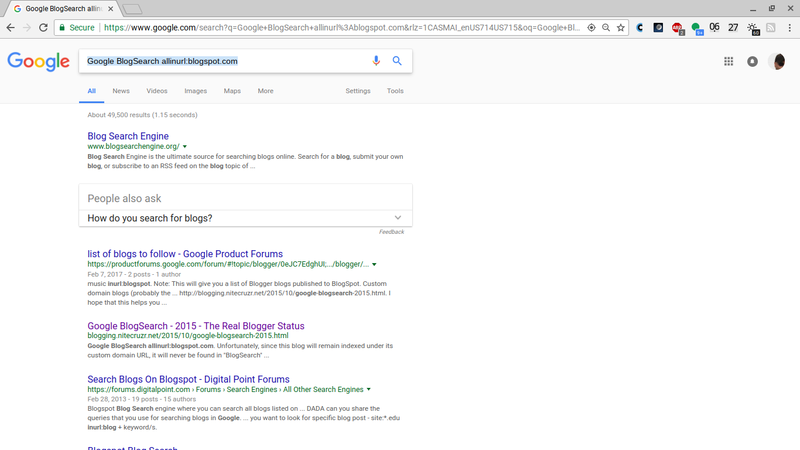 Blogger / Google now shows us that it is not possible to identify custom domain published Blogger blogs - or to identify Blogger blogs, in general, other than as websites published in the "blogspot.com" domain. 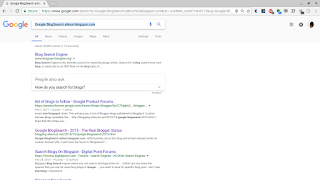 If you want to surf BlogSpot published Blogger blogs, you can do so in "Command Line" style, using Google Advanced Search Operators, and a standard Google Search Results Page. Your blogs of interest can be searched by replacing "Google BlogSearch" with the subject of your interest. Even though this blog is indexed under its custom domain URL, it can be found (as of 2017) in "BlogSearch" (2015 version). The Advanced Search Operators are more flexible than the Blog Search GUI. One of the problems with the old BlogSearch GUI was that it was too limited in options. For those who learn to use the Advanced Google Search Operators, you will have a wide variety of search options - that will apply to all blogs and websites. Blogger blogs will be treated more like websites, in general. People will learn to treat Blogger blogs more like websites, in general - than as a special class of blogs. This will be good for all Blogger blogs, in the long term. And the Google Custom Search Engine - and similar third party accessories, will be available, for use from our blogs. And, since it is simply not possible to distinguish Blogger blogs from non Google blogs, and guarantee to not pick up various search hijacks, custom domain published Blogger blogs will have to be searched along with all non Google blogs and websites. People who publish Blogger blogs to non BlogSpot URLs will have to compete with the non BlogSpot world - which is really what custom domain publishing should be, right? Following - How Do I Get Started?